This question comes up everytime I’ve played with someone new to the game. Many games require payment for advancement, but Dungeon Roll is not one of them. You do NOT have to discard 5 XP to level up your character. As long as you have 5 XP, your character automatically levels up to its more powerful side. -You have to have collected the XP. Just being on level 5 of the dungeon does not mean you have 5 XP, you have to successfully leave the dungeon to collect the XP, then if you have enough you can level up. -Beating a dragon gives you the 1 XP immediately, if this brings you up to 5 collected XP, you can immediately level up. It can be tempting to pass up one potion rolled on the Monster Dice since you need to commit one of your Party Dice to use it, but if your party is lacking diversity (three different classes for Sneak:Dragon), or you have a special ability that uses a particular die face, then quaff the potion with one of your overrepresented dice to “revive” the die as the particular face you want. More Warlords are usually not a bad thing, after all. Do you want the player who rolls the black dice to have a role that’s a little more meaningful? Allow them to re-roll any one black die on every dungeon level. This makes the game significantly harder for adventurers, but introduces some interactivity. Choosing to gather treasure in the early rounds can really pay off in the later rounds…especially if that dragon is close to waking up. 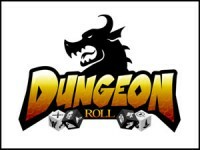 One of the drawbacks of the game is that with a larger group (which can even occur with four players) the players who are not rolling dice don’t feel engaged in the game until it is their turn to roll the dungeon or party dice. A simple and easy way to solve this is to allow the dungeon dice to move from player to player as the adventurer travels deeper into the dungeon. (I posted this as part of my review but felt it made more sense here). The game’s downfall is that the player rolling for the dungeon doesn’t have any strategy – they’re just a dice rolling machine. The complicated fix would be to give each adventurer card a DM skill, so when you’re rolling as DM you could have an ability you could choose to play. The easy way is for the DM to roll a D6 when the character rolls his party. Let’s say the die lands on 4. At any point after rolling for the dungeon, the DM could choose to re-roll up to 4 die before the character gets a chance to resolve. So if as the DM I rolled 2 treasure chests in level 2, I could reroll them, and turn my reroll die from 4 to 2 indicating the amount of rerolls I have left. It’s not huge, but it goes a long way towards keeping the DM roll interesting as opposed to mechanical. Give it a try. I replaced the green experience tokens with some miniature green dice. I just turn the dice to represent my total experience. It helps to keep the table top footprint down a little bit.